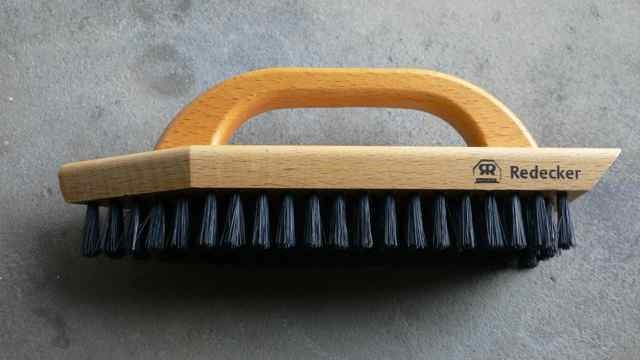 Use a soft bristle shoe cleaning brush to gently brush off dry dirt. If the shoes are very dirty, wash them using a soft shoe cloth dipped in some mild soap or washing up liquid. Rinse out the cloth and wipe the soap off the shoes. Let the shoes dry thoroughly. Avoid leaving them near a hot radiator or in bright sunshine as this might cause the leather to crack. If your shoes have white stains on them from road salt, then you can remove them by dipping a cloth in an equal parts mixture of white vinegar and water. Wipe them again with a clean, damp cloth. Use a shoe polish dauber to apply polish to your shoe. Avoid getting polish on non-leather parts of the shoe. Rub the polish in with another soft cloth. If your shoe laces are mucky, then they can be removed and put in a small cotton bag and washed in the washing machine, or else you can try hand washing them. You can buy a complete shoe cleaning kit or put together your own but it’s a good idea to keep everything together in one place, ready to use.